We are thrilled to share with you all of the events, parties, protests and panels happening opening weekend! Find your city below, get a ticket then join an event! Email foodchainsfilm@gmail.com if you have any questions. PROTEST/ACTION: Publix Protest Sunday at 2pm at the Center of Bonita Springs (3304 Bonita Beach Rd. – Bonita Beach & 41). Hamilton Fish, executive producer of Food Chains. PROTEST/ACTION: Join the Alliance for Fair Food for a march and screening. Email joe@sfalliance for more info. PROTEST/ACTION: March straight from the theater to a candlelight vigil at Wendy’s will follow the screening. PROTEST/ACTION: March to Wendy’s at Union Square to follow. See Food Chains in Spanish! PROTEST/ACTION: Join us for a protest at Publix at Lake Eola at 4:30 pm. 400 E. Central Blvd. PROTEST/ACTION: Before the screening, meet at Publix at Twelve Oaks Plaza for a protest!. Meet at 5:30PM at 7018 W. Waters Avenue. Reception to follow at Boveda Bar at the Westin Georgetown. PROTEST/ACTION: After the screening we will head to an event to call on Wendy’s to join the Fair Food Program. Join us at GW Plaza at the Foggy Bottom Metro Station. PROTEST/ACTION: Join us for a march to Wendy’s after the screening. 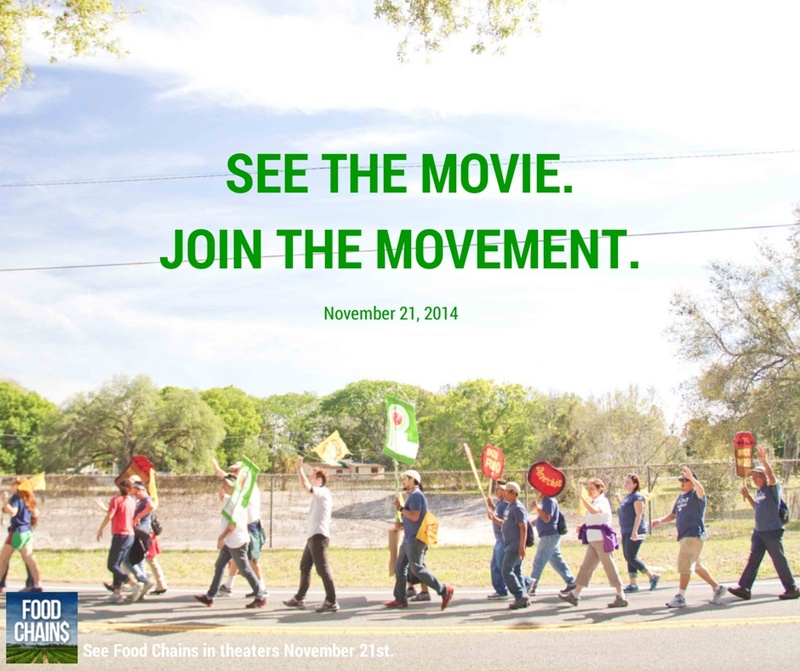 PROTEST/ACTION: After the screening, join us in a march to Food, Co.